Unless you have been living under a rock here in Singapore for the last few months, you will have noticed that the Formula 1 Grand Prix is about to hit Town this coming weekend. You are either in love with it; and have got tickets to brave the madness - or you will be avoiding the area like the plague, settling instead for the "in front of the TV option". 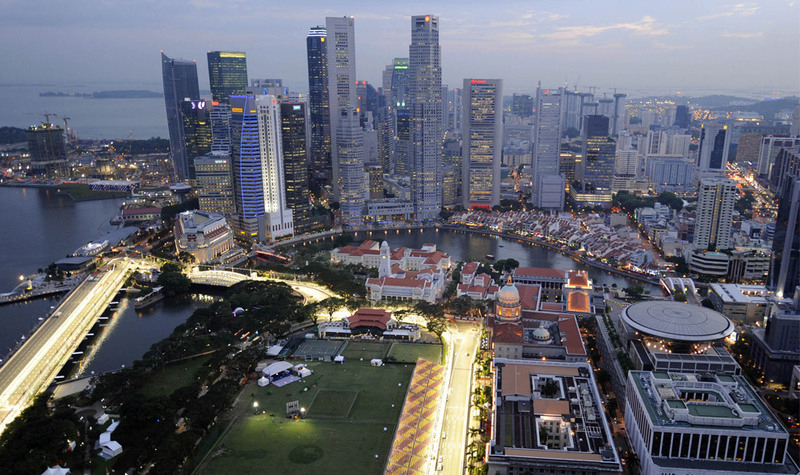 For the last few months, the streets of Singapore have seen some serious work going on to prepare for this amazing Grand Prix, the only night race of the Grand Prix circuit. Construction crews have been building barriers, erecting scaffolding, lighting, spectator stands and concert stages all around the 5.065km race circuit, known as The Marina Bay Street Circuit. Come the weekend, there will be major disruption to bus routes and roads as the circuit gets closed off. Getting in and out of the area will prove to be challenging. Already, many taxi drivers I have spoken to have said they will be trying to avoid the area or won't be working at all. The Hotels lining the track will have been fully booked months ago, with their rates no doubt increased dramatically to take most advantage. Many of the restaurants with good views will likewise be booked solid. I also know that the Cricket Club which lies at one end of the Padang, near to turn 10 (also known as Singapore Sling) will have no vehicle access for it's members for the whole of the weekend, though their members should have a great view from the club, once they manage to get there. For some, it is not the cars that are the big draw. We also have some huge musical acts coming to town. The Killers will open on the 21st September on the main Padang Stage, Rihanna is set to perform on the 22nd September with Justin Beiber and Owl City closing things down on Monday, 23rd September. Even Tom Jones and Bob Geldolf (slight groan) will be performing along with a host of other musical acts from all over the World. Beiber?! Do we really have to have Beiber!! Although I will be one of the "in front of the TV" group this weekend. I decided to go and take a look at the track before the big event to show you some of the roads these cars will be zooming down. My quirky take on part of the track at least. I started off at Raffles Place (City Hall MRT) which is where I saw this F1 show car, and; the always necessary F1 Merchandise store - (can never have too much F1 merchandise right?!) which has been temporarily erected just outside the Mall. Next I walked down towards the Padang along St. Andrews Road heading towards Connaught Drive. Normally, all you would see here is the open space of The Padang where the cricket club holds their matches. Now the spectator stands have been erected and even a temporary walkway over the road. The Padang itself will be the venue for the big concerts. A big concert stage having being put up. Spectator seating has been erected along St. Andrews road. Behind this is the Padang Concert Stage. Walking further down St Andrews Rd, it turns into Connaught Drive approaching Turn 10. A temporary walkway has been erected over the road. My view as I am walking down St. Andrews Rd towards the Cricket Club and turn 10. This is the final bit of "straight" before the cars hit turn 10. I walked towards turn 10, also known as Singapore Sling. Here the cars will zoom round a sharp bend to the left at 240km/h! You can see the Cricket Club in the photo below on the left hand side. The Cricket Club building on the left of the picture, approaching turn 10, also known as Singapore Sling. Once round turn 10 they will almost immediately hit turn 11 and then turn 12 which will take them over the Fullerton Bridge and into turn 13. A bit tricky negotiating the pavement/sidewalk. Out of Turn 11 they will almost immediately hit Turn 12 and go over the Fullerton Bridge. Racing towards Turn 11, the iconic Marina Bay Sands Hotel in the distance. Heading towards the Fullerton Bridge. Once over the bridge, another sharp turn to the left. Turn 13. By this time I had walked past turns, 10, 11, 12 and was approaching 13 which is where the Fullerton Hotel stands on the right hand corner. The sharp bend to the left on turn 13 will see the cars down to 80km/h and in gear 2. Heading away from the turn, down the straight on Esplanade Drive, will see them back up at 250km/h! This is a shot looking back towards the Fullerton Bridge, so imagine the cars coming towards you and then doing a sharp bend to your right (their left). I stood on the corner of turn 13, the cars will come from where the white truck is and aim for the guy in red crossing the road lol! Having negotiated turn 13, they will hit the throttle and head down Esplanade Drive and turn 14. Although I only walked along part of the track, it was pretty mind boggling to think of the speed these cars will be going on these roads, and at night too! Pretty scary! Please click here to see an amazing photo (from 2008) courtesy of AP Photo/Oliver Multhaup on the Boston.com website. It shows the section of track that I walked. Singapore has put a lot of time and I am sure money into this amazing night race. Months of work and effort to bring it to fruition will be torn down after the race, amazingly quickly, and Singapore will be back to so called normal - only to do it all again next year. The taxi drivers will be thrilled!